My best friend and I were discussing the "1 laptop per child" program the other day. The push is for these laptops to be battery powered ... recharged by cranking a crank. How many calories does that take? 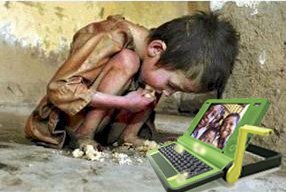 How can starving children who can't afford laptops, afford the physical effort to power these laptops? Will hand cranking the laptops burn valuable caloric substance? However ironic and funny that may sound ... it is a serious question. See Jackwhispers previous story: I hate children and their little laptops too!